What made this Harvest Festival different is that I did the majority of the work on my own. There was lots to do, of course, and I plan to talk about some of the things I did in future posts. This year the Harvest Festival included getting some of my wood for the winter into the basement. 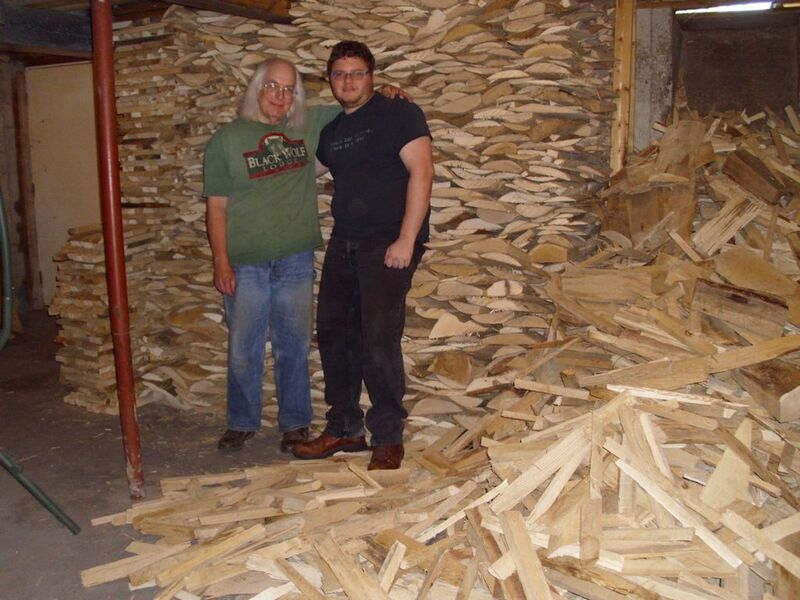 My friend Braden helped me get the wood down there—it’s a big job even for two people. I now have five cords down there and two cords outside. Seven cords will take me through most winters, but I’ll cut another cord just in case things get extra cold. The wood you see in the picture is mostly slab wood, with about a cord of logs underneath. Getting the firewood stacked in the basement was a big job. This year the apples ended up as chips for the most part. I also saved some for eating. The larder already has all applesauce, juice, pie filling, and odd assorted other apple products I could use. The remaining apples ended up with friends. I did make up pickled crab apples this year and did they ever turn out nice. I also made a crab apple vinaigrette salad dressing and canned it. The result is quite nice. For once, my pears let me down. The weather just wasn’t conducive to having a good pear crop. I did get enough pears for eating and a few for sharing as well. Every year is good for something though and it was a banner squash year. The squash vines grew everywhere. At one point, the squash was chest high on me—I’ve never seen it grow like that. The squash grew like crazy this year! 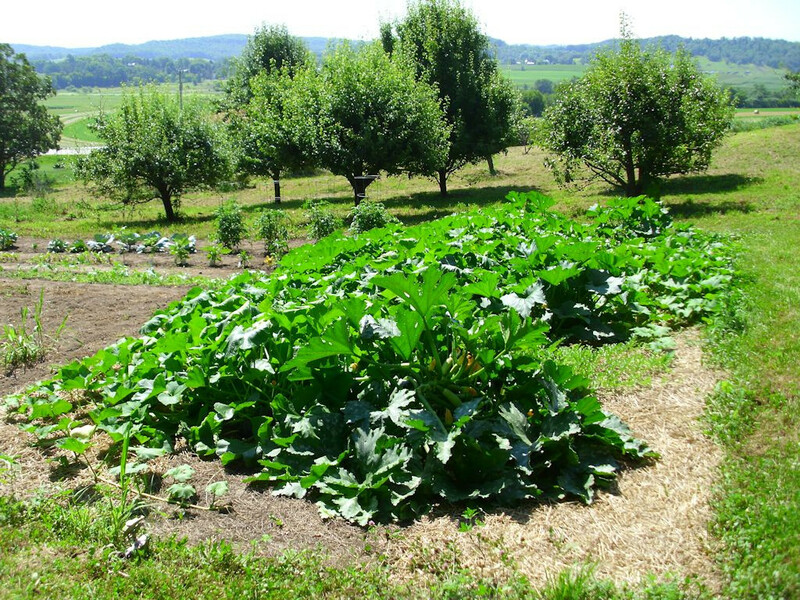 The picture shows the squash about mid-summer. By the end of the summer they had grown into the garden (overwhelming the tomatoes) and into the grass. The squash also grew larger than normal. I ended up with a total of 700 pounds worth of squash (much of which has been preserved or distributed to friends). Here is some of the squash I harvested this year. A cart full of squash. The largish looking round green squash (one of which has a yellow patch on it) are a Japanese variety, the kabocha squash. So far, I’m finding that they’re a bit drier and sweeter than any of my other squash. I think I could make a really good pie with one and they’ll definitely work for cookies. Unlike most winter squash, you can eat the skin of a kabocha squash, making it a lot easier to prepare and it produces less waste. Given that I received these squash by accident, I plan to save some of the seeds for next year. The squash I was supposed to get was a buttercup squash. The two look similar, but are most definitely different (especially when it comes to the longer shelf life of the kabocha). Canning season was busy this year. 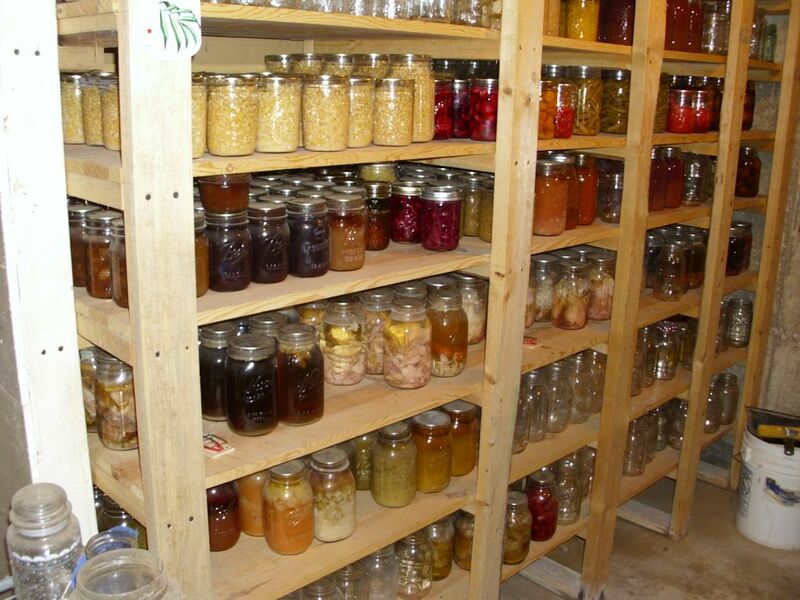 I’ve started filling in all the holes in the larder. For one thing, I was completely out of spaghetti sauce. Even though making homemade spaghetti sauce is time consuming, it’s definitely worth the effort because the result tastes so much better than what you get from the store. I also made a truly decadent toka plum and grape preserve and grape and pear juice. 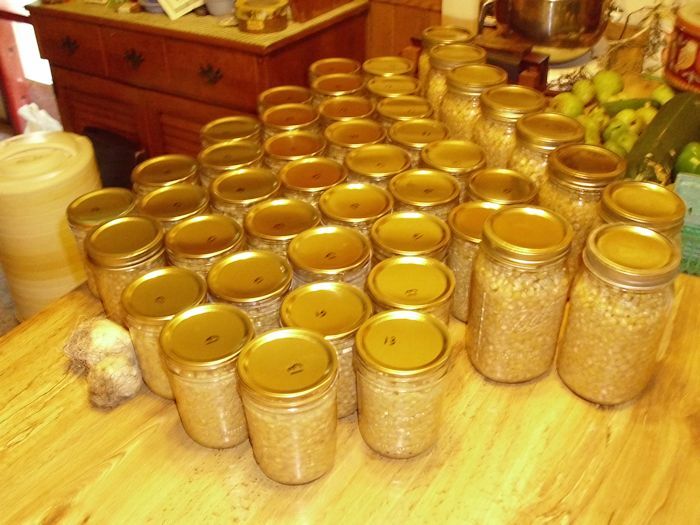 I’ve done hot water bath canning by myself before, but this was the first year I did pressure canning on my own. Let me just say that it all comes down to following the directions and not getting distracted. 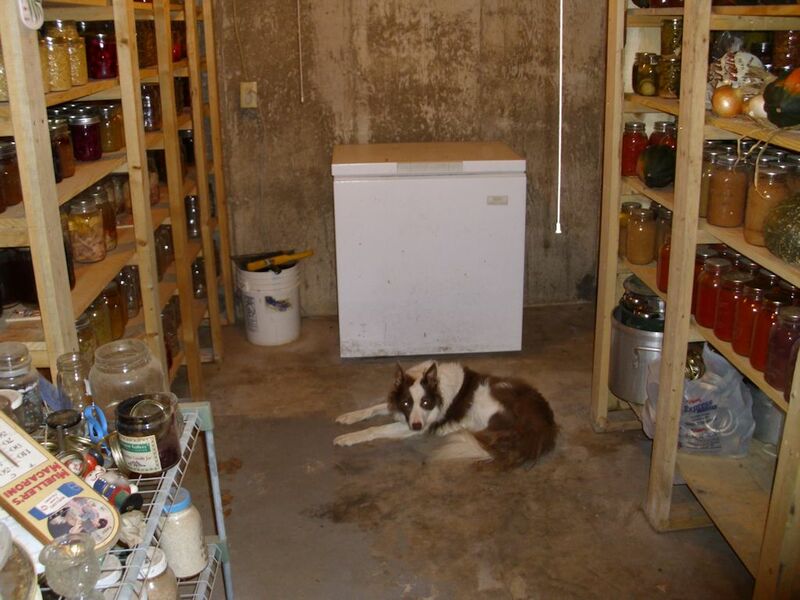 My two larder shelves are looking quite nice now (with Shelby on guard duty). A view of the larder from the front. 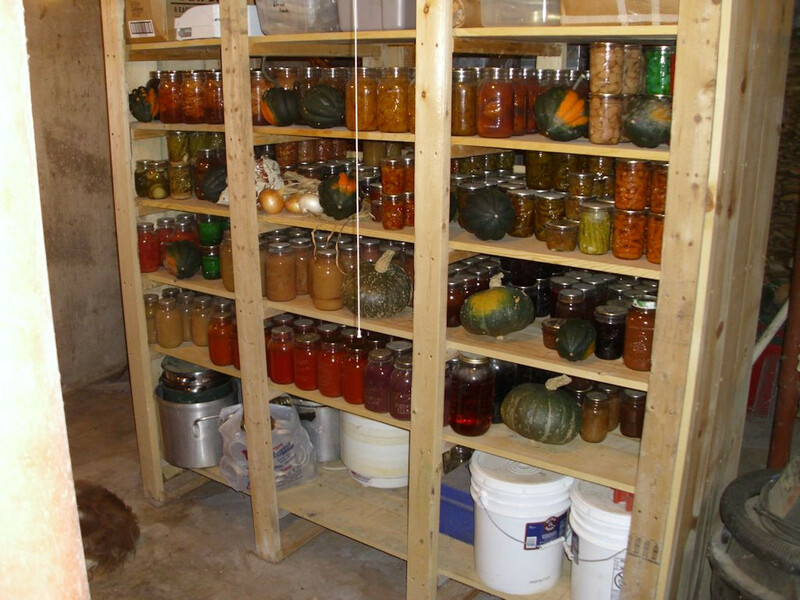 The right shelving unit contains mostly fruit products of various sorts and condiments. Yes, I even make my own ketchup and mustard. 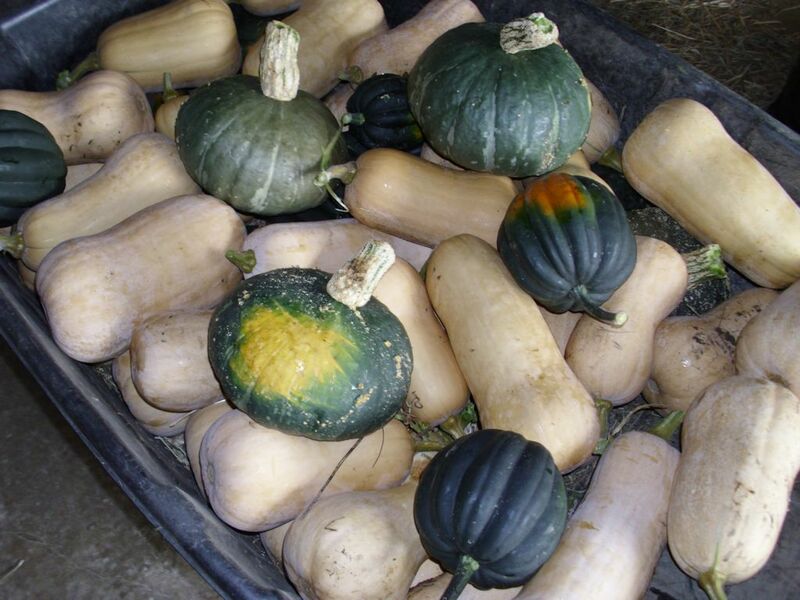 Of course, some of the squash also appear on the shelves, along with my cooking equipment and supplies. Let’s just say there isn’t a lot of room to spare. Fruit products dominate the right shelving unit. The left shelving unit contains mostly vegetables and meats. In years past I’ve canned venison, pork, and chicken. This year I thought I might try canning some rabbit as well. Canning the meat means that it’s already cooked and ready to eat whenever I need it. The meat isn’t susceptible to power outages and it lasts a lot longer than meat stored in the freezer. Even though canning meat can be time consuming and potentially dangerous when done incorrectly, I’ve never had any problem doing so. The left shelving unit contains mostly vegetables and meats. Harvest Festival 2015 has been a huge success. The point is that I have a large variety of different foods to eat this winter, which will make it easier to maintain my weight and keep myself healthy. I had a great deal of fun getting everything ready. There was the usual music, special drinks, and reminiscing about times past. What makes your harvest preparations joyful? Let me know at John@JohnMuellerBooks.com. Normally Harvest Festival is a well-organized event for us. I plan the time carefully and include a week out of the office to ensure I have time to harvest the last of the garden and all the fruit without problem. However, all the planning in the world won’t account for the vagaries of nature every time. Even though the Harvest Festivals in 2011 and 2012 went off precisely as planned, the Harvest Festival this year ended up being one emergency after another. It started when our fruit ripened three weeks sooner than expected—make that half the fruit. The other half of the fruit is ripening this week on schedule. The odd ripening schedule points out another potential issue with global warming, but more importantly, it demonstrates the requirement for flexibility when you’re self-sufficient. Yes, it’s possible to plan for a particular outcome, but what you get could be an entirely different story. This year’s Harvest Festival was stretched out over three weeks while I continued to write and do all of the other things I normally do. (Fortunately, Rebecca was able to put many of the tasks she needs to perform on hold.) Of course, the dual work requirements made for some really long hours. Creating an enjoyable work environment is one of things that Rebecca and I work really hard to obtain. It’s part of our effort to make our close relationship work. So, this Harvest Festival included all of the usual music and other special environmental features we normally have. Lacking this year was much in the way of game playing, but it was a sacrifice we needed to make. 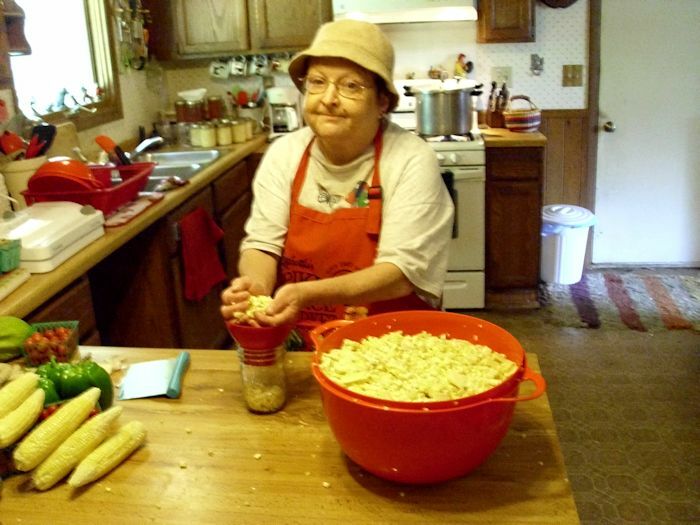 One of the bigger tasks we took on this year was processing four bushels of corn that someone gave us (all in a single day). Actually, the corn came from a few different sources, but the majority came from a single contributor. 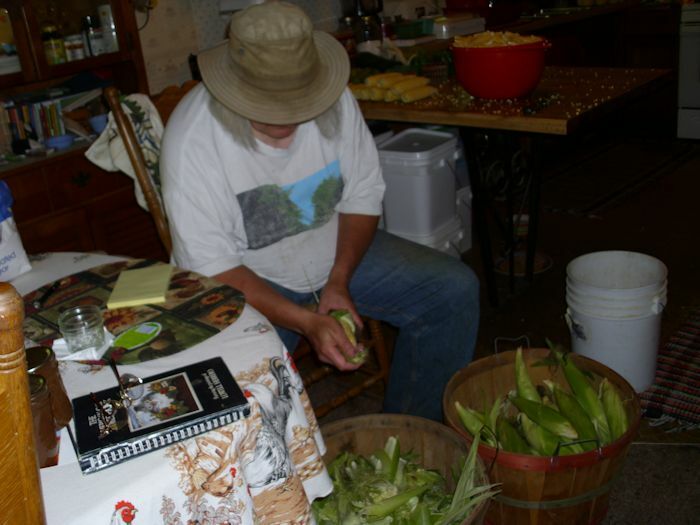 Of course, we started by husking the corn and getting all of the silk off. The next step is to cut all of the corn off the cob. This step can be a little tricky. You need a moderately sharp knife around 8″ long. 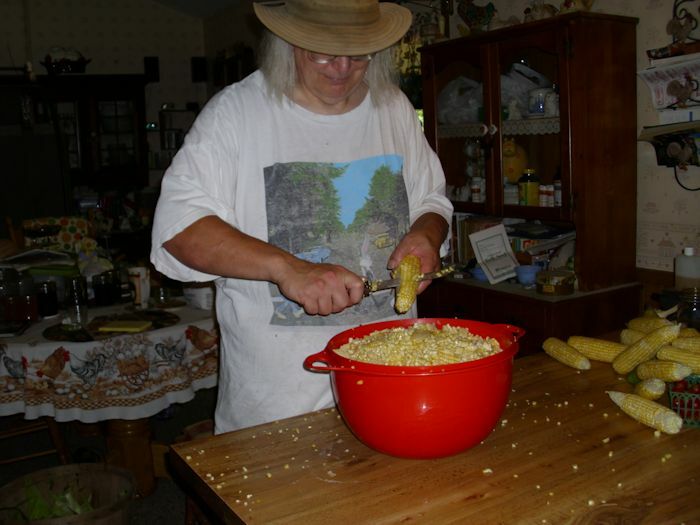 If the knife is too sharp, you’ll take off some of the cob with the kernels. A knife that is too dull will damage the corn and make a huge mess. The knife needs to be long enough so that you can remove the kernels safely—a pairing knife would be an unsafe option. We use a raw pack approach when working with the corn. You want to be sure to pack the corn firmly, but not crush it. Rebecca always takes care of this part of the process because she has just the right touch. Each pint or quart is topped off with boiling water at this point. We don’t add anything else to our corn. The corn needs to be processed in a pressure canner because it’s a low acid food (the processing time varies, so be sure to check your canning book for details, we rely on the Ball Blue Book and have never had a bad result). We had four fresh meals from the four bushels of corn. There is nothing quite so nice as corn roasted on the barbecue. We also gave the chickens an ear (plus all of the cobs). 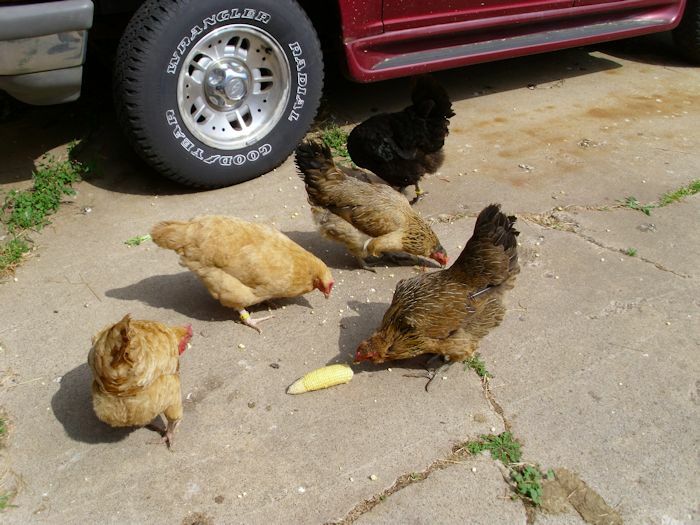 They seem to have quite a good time pecking out all the kernels. 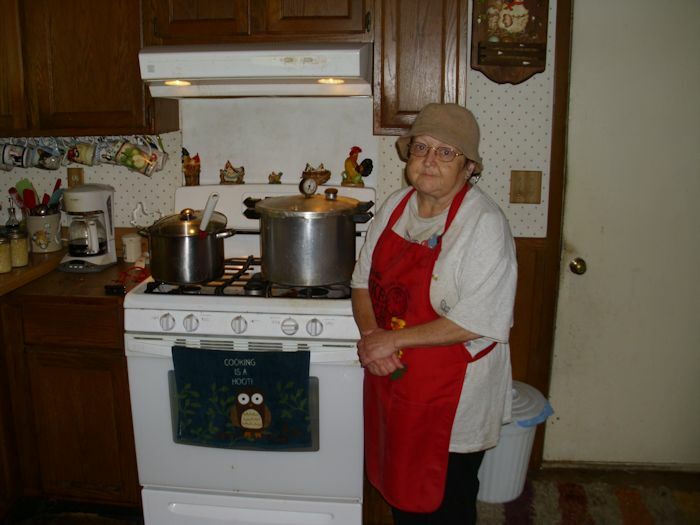 Even with these few subtractions, we ended up with 42 pints (each pint will last two meals using the recommended serving size of ½ cup) and fourteen quarts (used for soup and for company) out of the four bushels of corn. As a result, we have enough corn in the larder now for about 1½ years (a total of 140 servings). Our Harvest Festival this year included processing pears, grapes, apples, a wide variety of vegetables, and even some of the meat chickens (125 ¾ pounds worth on a single day). The point is that we did get the work completed and we did it while still having as much fun as is possible. We’re both admittedly tired and still resting up. Still to come is the garden cleanup and the wood cutting, and then we’ll have an entire winter to rest up for next spring. Let me know about your latest self-sufficiency emergency at John@JohnMuellerBooks.com. It always pays to look at your trees carefully before you do anything with them. You never know what will be living there, especially if you’re like me and don’t use noxious sprays. There are many times where birds are nesting in the trees and I try my best not to disturb them. Trees also harbor a number of insects and other animals. Whatever is hiding in that tree, it won’t be apparent when you first approach. For example, this pear tree looks perfectly normal. I was approaching it one morning to pick the ripe pears and it looked just like this when I first saw it. However, I always exercise caution when I want to do something with the tree and in this case, caution was very much warranted. 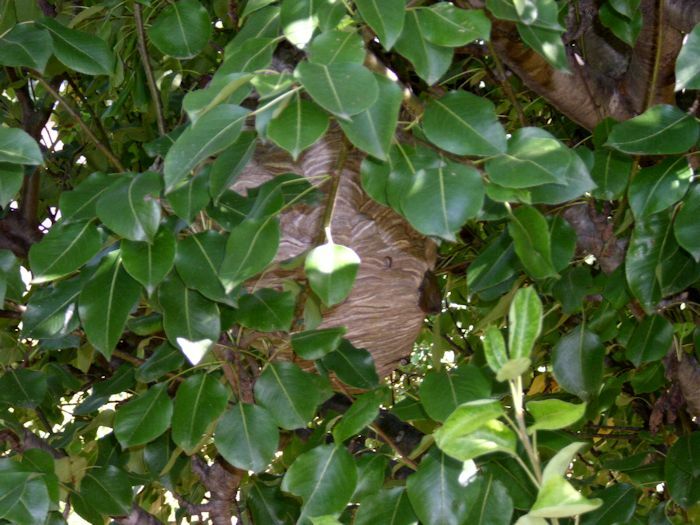 Hiding in the tree was a hornet’s nest (about 24″ tall and about 12″ in diameter). Even when you get up close (and this was as close as I dared to get), the hornet’s nest isn’t immediately obvious. You really need to look before you do anything or suffer the consequences. Unfortunately, this tree has around 60 pounds of fruit on it. The fruit will likely go to waste because it isn’t worth getting stung to retrieve it. The deer will likely enjoy some good meals off us this fall as the pears drop and ferment. Of course, the first thought would be to get someone to remove the nest, but the cost of doing so would far outweigh any benefit obtained from retrieving the fruit. In addition, hornets are one of those odd insects that are neither completely useful nor a complete nuisance. In the spring and early summer, hornets are helpful predators that actually kill off extremely harmful pests. The particular kind of hornet that we have, the bald faced hornet, also helps pollinate our trees. It’s one of eleven pollinators that I’ve identified that visit all of our trees during the spring. In other words, killing the hornets is a bad idea. During the fall months, the tastes of the hornet change and they begin craving sugar. That means eating into some of the fruit we grow. However, they’re only attracted to fully ripe fruit that is almost to the point of being a little overripe. We avoid damage from the hornets by picking our fruit when it’s just a little underripe. When a hornet has made a small hole, we can brush it away. The bald faced hornet isn’t aggressive except when it comes to its nest (or outright abuse by humans). Respectful treatment doesn’t result in a sting (at least, Rebecca and I haven’t been stung by them them entire time we’ve had fruit trees, which is over 17 years now). The only thing that will really get you into trouble is disturbing the nest, which is why that tree will remain unpicked this year. Once winter arrives, the majority of the hornets will die. The new queens will live on in the center of the nest, ready to emerge in the spring. What I’ll do is cut the nest out of the tree during a day when the temperatures are below freezing, move the nest to a sheltered tree in the woods, and tie it into place. When spring comes, the new queens will emerge in the near woods, produce a brood, and those new worker hornets will help pollinate our trees. Discovering how to work with insects is an essential part of being self-sufficient. If I were to take the same approach that most people take, it would cost me money to remove the nest and then it would cost me more money when my trees aren’t pollinated properly in the spring. Taking the approach I am now is counterintuitive, but it’s also the best approach to use. Let me know your thoughts about hornets at John@JohnMuellerBooks.com. I’m continually reminded by the weather that nothing is certain about gardening than uncertainty. Our pear trees served to illustrate the point on Saturday. I had checked them just a few days before and the fruit was still rock hard. Of course, that was before a heat wave hit (it has been in the upper 80s and low 90s here) after a relatively fall-like period. The change in weather caused the fruit to ripen incredibly fast. By yesterday (Sunday) we already had some fruit on the ground because it had fallen off, overripe. The odd thing is that the weather has only affected four of our pear trees. Normally, the pears ripen pretty much at the same time, but that isn’t the case this year. We’ll have two distinct picking periods, which might actually be beneficial given the size of the harvest this year. You can be certain that I’ll be watching the other four pear trees quite closely. Even with the drop off, the harvest this year is huge. We didn’t pick up any of the windfalls yesterday because they really were quite bad. The trees have yielded 200 pounds of fruit so far and there is more to pick. We stopped picking because we’ve run out of space to put the pears in the house. So, we’ll process this batch and pick some more. Of course, I’m wondering what has caused the odd ripening and why it has affected only some of the trees. I think the weather is definitely the cause. The variance in temperatures can be attributed to global warming, but I think there must be something more to it than that. I do know now that I’ll need to check the trees every day during this time of the year from now on (normally I check every three or four days until the fruit starts to ripen, at which point, I start checking every day). There are consequences to the early ripening. In checking the fruit yesterday, I did note that the pears are larger than normal, which is probably the result of those early spring rains. The water content is also considerably higher than normal, which means that we probably won’t be making much pear butter this year (it would take too long to boil the pears down). Even though the pears taste wonderful and are a bit more flavorful than normal, the sugar content is considerably less than normal. The main reason is that the pears ripened before the sugar content could rise. As a result, we might have a hard time making pear jam and using the pears for wine will be harder too. The pears will make amazingly good juice, chunks, and pear sauce. Rebecca also plans to make some more pear mincemeat. Our larder was starting to get a bit low and we had hoped the pears would be suitable this year (they are). The lower sugar content has had one positive effect. Normally we have to battle hornets during this time of the year. They like to eat holes into the pear and sometimes a piece of fruit will contain a hornet when you go to pick it (making it necessary to look carefully at the fruit). The hornets are definitely fewer this year. On the other hand, we’ve noticed a few more earwigs than normal. Both hornets and earwigs are beneficial at other times of the year because they do keep other parasites in check. The key to avoiding an infestation is to ensure you pick the fruit just before the peak of ripeness (the fruit has a good taste and the sugar content is high, but it’s still a little hard). If you wait until the fruit is completely ripe, hornets and earwigs will almost certainly attack it. We have been working with fruit for about 17 years now and no two years have been precisely the same. There are general trends in how our fruit will react in any given year, but nothing precise. 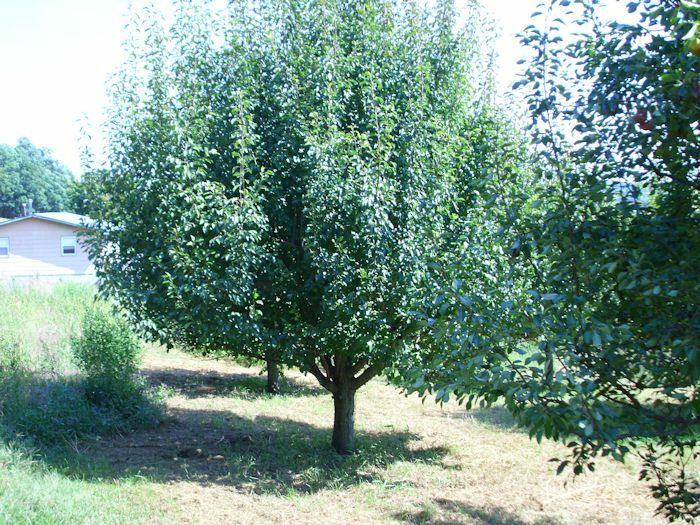 Flexibility is key in making an orchard work. So, what are you seeing in your orchard this year? Let me know at John@JohnMuellerBooks.com.